Below, a collection -- hardly comprehensive -- of links that may help you in researching combat stress or post-traumatic stress. I will add to this list occasionally. Please drop a comment and share other sources of data that you feel would be a good addition. The links below will take you to the del.icio.us bookmarking resource I've been using since September 2005 to organize the links I've come across as I've been doing my research. 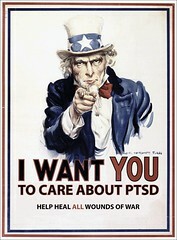 The tagged webpages include my posts here at PTSD Combat as well as elsewhere; but, it also includes off-site combat stress and PTSD-related articles and websites that I think you might find useful in your own research. Finally, a list of the most important tags used here at PTSD Combat. These links will return all posts under that label, so the pages may take some time to download (depending upon how many posts the label has to return), so it may require some patience if you're working on dial-up. 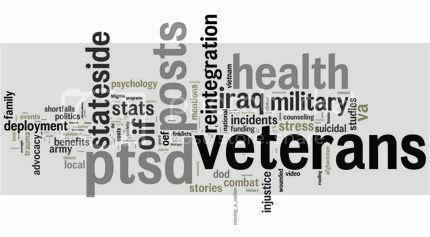 The PTSD Timeline is a database of press- and independently-reported OEF/OIF PTSD-related incidents. I first began tracking these incidents in September 2005, and in December of that year was asked to partner with ePluribus Media to house my research. At the time, ePluribus Media, a citizen journalism initiative, was the only group tracking cases of possible, probable or confirmed reports of post-combat reintegration difficulties, making them publicly available for further research, study and reporting. Since then, the data has been requested and/or accessed by government bodies such as the House Veterans Affairs Committee and Senator John Kerry’s office, dozens of media outlets, researchers, journalists and veterans organizations. For the past two years, the timeline research (which is pro bono work donated by everyone involved with the project) has been sporadic due to my class load and the writing of my book; still, there is some valuable data to be found in it. More details.